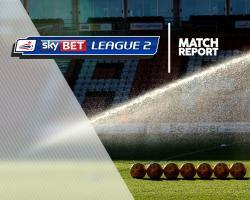 Blackpool moved up to sixth with a resounding 3-0 win at home to Cheltenham to boost their League Two play-off chances. Goals from Mark Cullen, Clark Robertson and Neil Danns did the damage but the Seasiders remain just two points clear of 10th placed Carlisle as the battle for the top seven intensifies. Danns almost put Blackpool ahead after 20 minutes, surging through the middle and firing a low shot from 18 yards which cannoned back off the post. Colin Daniel's left-wing cross was cleared by Jordan Cranston straight against Cullen and it rebounded into the net from two yards. The lead was doubled six minutes later when a series of goal-line blocks denied a host of Blackpool players before the ball fell to defender Robertson who thumped into the roof of the net from 15 yards. Cheltenham almost grabbed a lifeline goal after 56 minutes as Carl Winchester whipped a cross in from the right which had Sam Slocombe scrambling and bounced off the top of the crossbar. But Blackpool sealed the win after 62 minutes when Daniel squared for Danns, who had the simple task of slotting home from eight yards.